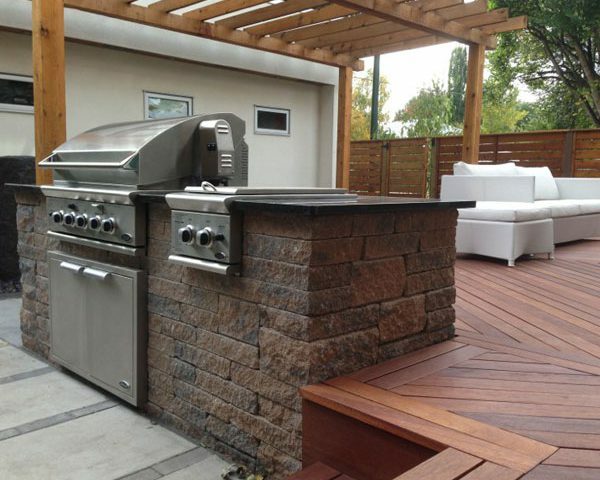 Outdoor kitchens are becoming more and more popular in Calgary. Even though our winters can be long and cold don’t let that stop you from enjoying outdoor cooking. For this landscaping project we used a Techo bloc outdoor kitchen The Techo bloc outdoor kitchen is made of precast stone and includes a electrical outlet, double burner and granite counter top. Granite counter tops are ideal for outdoors in Calgary because they can handle the cold and stay looking great year round. We installed a beautiful kayu hardwood deck next to the outdoor kitchen. Kayu is a beautiful mahogany type hardwood that is much more durable than cedar. Natural woods like Kayu can really warm up your outdoor space and are especially important if you have a lot of cold landscaping components like concrete or paving stones. Placing the deck boards on a forty five degree angle gives your deck a sleek modern look. Basalt bubbler water features are low maintenance water features that don’t require much for winterizing like ponds or waterfalls. These subtle yet soothing water features give you a realizing calming element to your landscaping. The water flow can be adjusted to increase or decrease the amount of water coming out of the top of the basalt bubbler. This in turn increases or reduces the volume of the feature. This simple cedar pergola creates a cozy feel to the back yard and compliments the kayu hardwood deck very well. It is built with basic cross beams that are not too ornate and therefore they don’t take away from the rest of the landscaping. The cedar pergola provides some shade but not too much to block sunlight to the plantings underneath the Pergola. Cedar Pergolas are a wonderful addition to any modern landscaping project. Both the pergola and the deck will require annual staining each spring for fall in order to maintain their rich natural wood tones. Learn more about our modern landscaping wood structures by visiting Pergolas and arbors . Ask us about what components to use for your modern landscaping Calgary project.